« Is that a boat?! Where’d the bike rack go? 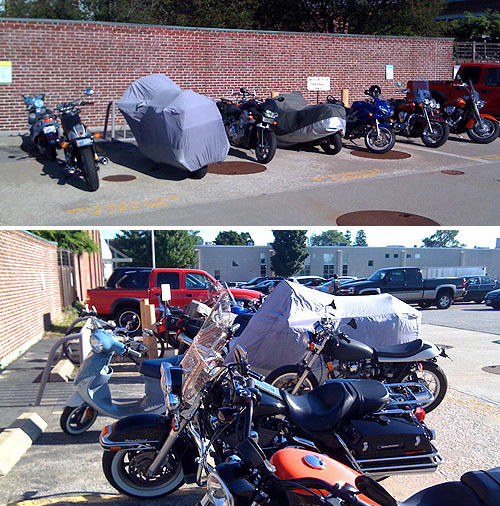 Where I work, bicycles and motorcycles share the same little corner of one of the back lots for parking. Most of the time there’s plenty of space to go around, but on clear summer days like today, the cyclists get this scenario above in which the bikers park their motorcycles right up to and around the bicycle rack, functionally blocking it off. Squeezing yourself through astride a bike and wedging it in against the rack is really more delicate a task than I want first thing in the morning. Not to mention the disregard for the cyclists who use the space. I’d also note that I’ve brought this and other cycling-related issues up with various people here, all eventually stalling out at dead ends. While there are many lovely aspects to working for this company, they are painfully old school in a lot of ways. Still working on it, though!